Some fresh faces emerged for South Carolina this spring, and at more than one position, the coaching staff is pleased with the talented depth at hand. Entering Will Muschamp’s fourth season in Columbia, the Gamecocks return 16 starters and bring in two blue-chip recruits who were ranked higher than any recruit since the 11-win golden days under Steve Spurrier. Muschamp will take that roster into a difficult schedule against 6 opponents that finished in the Associated Press top 16. Between Jake Bentley’s experience, and the budding talent of Dakereon Joyner and Ryan Hilinski, there are plenty of options. Now it’s up to the coaching staff to decide the best way to deploy that talent. Not to mention, how the younger QBs can contribute in special situations. The modern challenge is keeping everyone happy after the competition ends and the season begins. 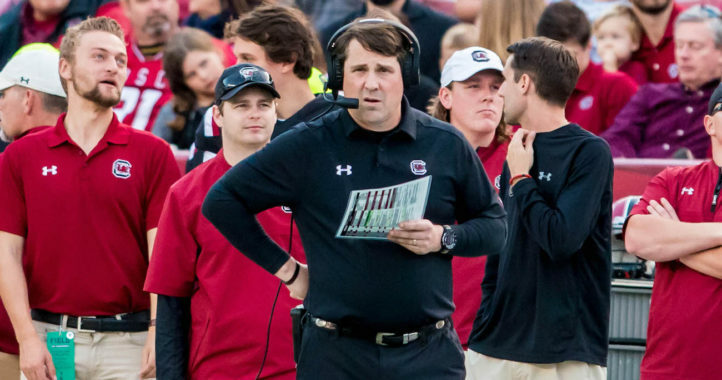 Muschamp and his staff have yet to face this kind of situation at South Carolina. In many ways, Bentley puts Muschamp at ease with his leadership, experience, knowledge of the playbook and ability to make key throws. However, interceptions have continually plagued Bentley’s growth into the elite category of SEC quarterbacks. 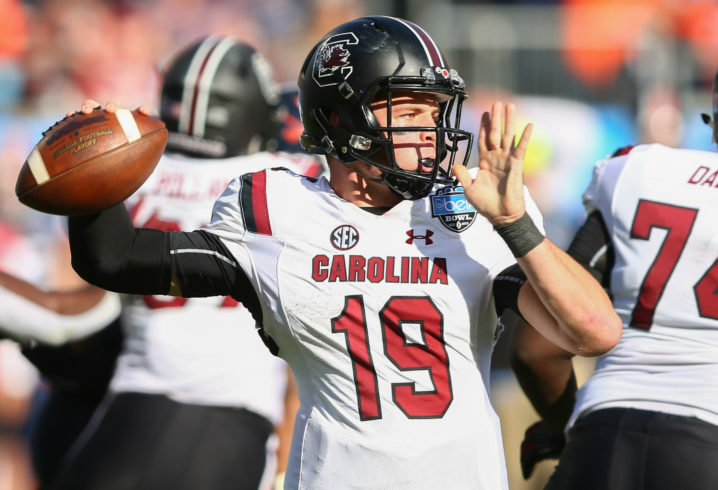 By Oct. 1, the Gamecocks could be 4-1, but that’s largely dependent upon quarterback play and turnovers. Kevin Harris was a bruising bright spot for the Gamecocks this spring as carries opened up following the transfer of Ty’Son Williams and a groin injury to Rico Dowdle, which sidelined him. The asterisk for the Gamecocks is Muschamp has said A.J. Turner and Mon Denson would be the top two backs entering the fall, but Turner played defensive back throughout the spring. Denson was South Carolina’s second-best runner last season, as he collected 432 yards on 80 carries as he made two starts in the revolving door of a backfield. Overall, it’s another area that seems to be poised for a breakout season, but too often in recent years has struggled to reach a higher gear. The Gamecocks haven’t finished better than 10th in the SEC in rushing since 2014, when they ranked No. 9. They were No. 13, No. 12 and No. 12 in Muschamp’s first three seasons, respectively. Dowdle is getting another crack at being a feature back, something he had the chance to grab in 2016 when he had 4 touchdowns and two 100-yard games in a month. However, Dowdle has struggled to find consistency atop the depth chart and on the field. Jay Urich was arguably the brightest breakout performer across the roster. His long touchdown and versatility in the Garnet and Black Game was something not many expected. Add Urich to a veteran group headlined by Bryan Edwards and Shi Smith, and the Gamecocks have one of the best wide receiving corps in the SEC. Edwards will assume the Deebo Samuel leadership role, while Smith is looking to build on the 74 passes for 1,082 yards and 7 touchdowns in his first two seasons. Kiel Pollard and Kyle Markway are experienced tight ends capable of making one or two key catches per game. This unit is a team strength. The Gamecocks have a solid starting group, including several players, such as Donell Stanley, Sadarius Hutcherson and Dylan Wonnum with experience. However, depth is somewhat of a concern as the incoming freshmen will likely need to contribute, at least as backups. One question is at center where Hank Manos, Eric Douglas and former walk-on Chandler Farrell are competing. This area might be the most encouraging for Muschamp, purely from a depth standpoint. Of course, there’s 5-star Zacch Pickens, but some of Muschamp’s first comments following the spring game were about the number of athletic bodies moving in and out. 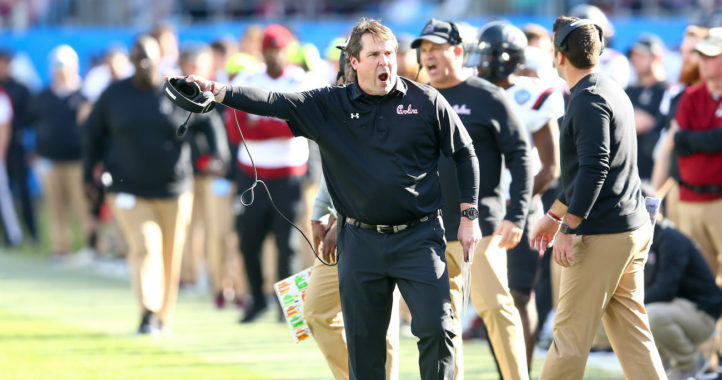 Muschamp is well aware that the defensive front is what separates top teams in the SEC apart, and he’s almost giddy that the Gamecocks have closed the gap in that regard. There are at least five veterans at the pass rushing positions, led by D.J. Wonnum. The concern here is numbers and health, and that’s one reason Turner moved to the other side for the spring. As much as Muschamp is excited about his new catch phrase, “competitive depth,” along the defensive front, the secondary has little competition. However, Jaycee Horn and Israel Mukuamu have provided some optimism. That cornerback position in recent years has been hit by a mix of injuries, sub-par play and penalties. Any combination of that would put a dark cloud over the defense in a hurry. Safety offers a bit more depth and competition from the likes of J.T. Ibe, RJ Roderick, Jamyest Williams and Jaylin Dickerson, but those last two have dealt with injuries that have limited their contributions. Parker White did enough in 2018 to earn a scholarship, something that was unveiled in video fashion at the spring game. He might be most remembered for his game-winning kick in the water-logged victory over Missouri. Joseph Charlton, meanwhile, registered a healthy 44.84 yards per punt in 2018. Replacing Samuel will be a challenge at kick returner, but there are plenty of names in the mix, including Turner, Smith, Dowdle, Edwards and Josh Vann. It’s no secret that the secondary is the area that needs the most improvement, and likely running back consistency would be next. In the spring game, for example, there were two walk-ons who served as backups at cornerback. Cam Smith and John Dixon, two incoming freshmen, are expected to offer relief. To compete in the SEC East, there also needs to be a back who can at least close in on 1,000 yards rushing. There’s been a hole in that area for several years.